Pop Up New Business With A Pop-Up Tent! 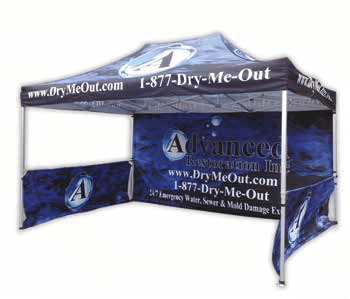 All Pop-Up Tents are printed using full-color dye sublimation. These easy to assemble systems make great promotional canopies for festivals and outdoor events. Each tent easily collapses to fit into a deluxe roller-bag, for absolute ease of transport. Tent elements can be ordered all together or separately. Options include: canopies, valances, full walls or half walls. Your customized tent will grab attention wherever it is displayed. All tent framework is constructed from heavy-duty anodized aluminum. Festival tents or outdoor event tents are available in 10x10ft, 10x15ft and 10x20ft configurations. 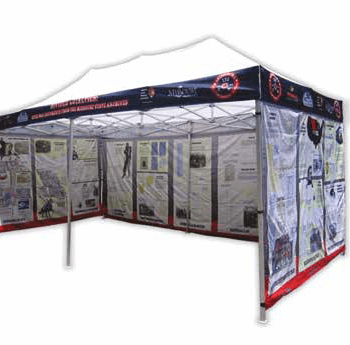 Our standard Pop Up Tents are Printed using full-color dye sublimation. Heavy-duty anodized aluminum framework. Simple assembly. Collapses to fit into deluxe roller-bags for ease of transport. A more spacious variation to our original Pop Up Tents are slightly larger variation to the original design with the same full-color dye sublimation, these easy to assemble systems make great promotional canopies for festivals and outdoor events. Each tent easily collapses to fit into a deluxe roller-bag, making transportation a breeze. The largest of all our Pop Up Tents for maximum advertising space! 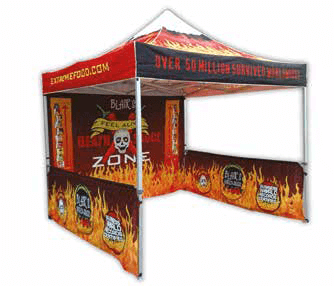 This monster-size promotional canopy will provide your customers with plenty of shade from the elements and wall space for your graphics. These easy to assemble systems make great festival tents, outdoor event tents and tent booths. Each tent easily collapses to fit into a deluxe roller-bag, making transportation simple.